American Expedition Vehicles (AEV) has been making superior off-roading systems for vehicles since 1997. Keene Chrysler Dodge Jeep Ram is proud to bring AEV to you for your new Jeep Wrangler. Although parts and accessories are part of the manufacturer’s lineup, AEV is better known for their vehicle packages that enhance capabilities off the beaten path. This includes everything from steel front and rear bumpers to lift kits to customize your driving experience off-road. With systems designed exclusively to make your ride smoother, more capable, and take on more rugged terrain than ever, AEV delivers parts, packages, and accessories for all types of vehicles—one of the most popular being the AEV Jeep Wrangler. Jeep lovers appreciate every component in these packages exclusively designed for Jeep, which work seamlessly together to create a very efficient off-roading experience from Jeep and AEV. At Keene Chrysler Dodge Jeep Ram, we offer AEV turnkey packages for your next Jeep Wrangler. When you buy a Wrangler with us, we can have it ready for you with the AEV package of your choice. Proudly assembled in Michigan and made in the United States, AEV provides an enhanced level of Jeep proficiency that Jeep alone can’t create. You get enhanced protection with your AEV Wrangler package. 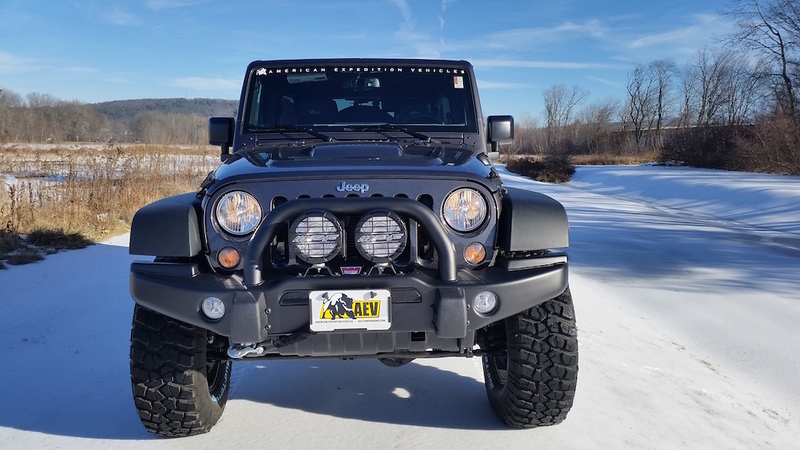 A front stamped steel bumper and skidplate offer protection in addition to style with a unique look, but one that packs off-roading protection and power. You’ll have the option of an available WARN winch and IPF off-road lights to bring you more capability along with your vision prowess. Your rear bumper extends this protection to the back. With several recovery points and integrated water storage in the bumper, you can also opt for splash guards on your kit. The tire carrier that’s so characteristic of Jeep Wranglers can actually feature different accessories to totally customize what you’d like to use that space for. These include an AEV Hi-Lift/Pull-Pal Mount, a 10.2-gallon Fuel Caddy, or an IPF Back Up Light. Available rear corner guards compliment this package with steel stamped protection for whatever your Jeep is tackling. Don’t forget the AEV Heat Reduction Hood to add a visual edge of ruggedness, along with defined curves. This hood keeps your engine temperature down and reduces any hood flutter at high speeds. Aluminum alloy wheels feature recessed valve stems in order to protect them from harsh off-roading conditions. A DualSport suspension system is also part of your AEV Jeep Wrangler package. These systems offer optimized handling, a smoother, quieter ride, and additional load carrying capabilities. This also provides the range of wheel travel you need to conquer just about any situation off-road. Speaking of wheels, AEV offers a range of lift heights. You can choose the height that’s best for you based on what you’ll be using your Wrangler for. You have the option for a 2-inch lift with 33-inch tires, all the way up to 4.5 inches with 37-inch tires. The choice is yours! A Hemi V8 engine is part of an upgrade that offers additional power and skill in addition to drivability and reliability for your Jeep. Choose from a 5.7-liter engine or a 6.4-liter one. These options allow you to take advantage of every inch of potential your new Jeep Wrangler offers. Vehicles fitted with these packages are known for tackling some of the most insane and rugged terrains in the world. In addition to having increased skill and accessibility off the road, AEV doesn’t disappoint for ensuring your Jeep is unique and protected on the inside and the outside. When it comes to the interior upgrades, you can opt for leather seats in three different styles to suit your taste. If you do choose leather seats but want to protect them from the elements—in addition to any kids or pets—AEV CORDURA seat covers fully protect your upholstery to keep it safe and looking like new for those times when your Jeep is doing some city driving. These are further accented by floor and cargo liners that are specifically designed to protect your Wrangler. No matter what terrain you’re going out in—wet snow, dry sand, or dirt and mud—these liners offer protection for all weather, in addition to adding an element of style to your Jeep Wrangler. With exclusive branding for their packages—including exterior badging, a window decal, and embroidered headrests—AEV lets everyone know just how capable your Jeep Wrangler is. You’ll even get a custom gauge cluster in addition to a Build Plaque, which includes the inception date of your package as well as a serial number for AEV’s reference. You’ll only find these options from AEV and Jeep—Keene Chrysler Dodge Jeep Ram gives you the ability to outfit your Wrangler with this package before you even drive the vehicle, making sure you’re ready to go when the time comes! Choosing your next Jeep Wrangler and deciding on an AEV package is easy when you work with us at Keene Chrysler Dodge Jeep Ram. This is because we have the dedicated project specialists to help you decide on a Wrangler and provide you with an AEV-ready Jeep for pickup. We even offer Direct Vehicle Delivery to customers throughout New England. We take the hassle and stress out of buying a car with our services. Our vast inventory includes both new and used vehicles, and our in-house financing team ensures you can get a loan with us for your next car. Our service center maintains your Jeep Wrangler while our parts center offers factory-backed parts and accessories designed specifically for Jeep. Our customers are our family, and we treat you as such. You’ll never be met with anything other than the utmost respect and friendliness from our product specialists. Our staff is extremely knowledgeable and devoted to not only their career, but their customers. We aim to make your experience with us enjoyable and exceed your expectations for buying a Jeep Wrangler from Keene CDJR. We’re located at 410 Winchester Street in Keene, New Hampshire. We invite you to visit us or call (866) 360-8420 to talk more about your next AEV Jeep Wrangler!